Jacele Johnson, 4, in the back of an ambulance on June 1, 2015. CHICAGO (WLS) -- Jacele Johnson, 4, waved as she left the hospital Monday morning, one-and-a-half weeks after she was shot in the head in the Englewood neighborhood. 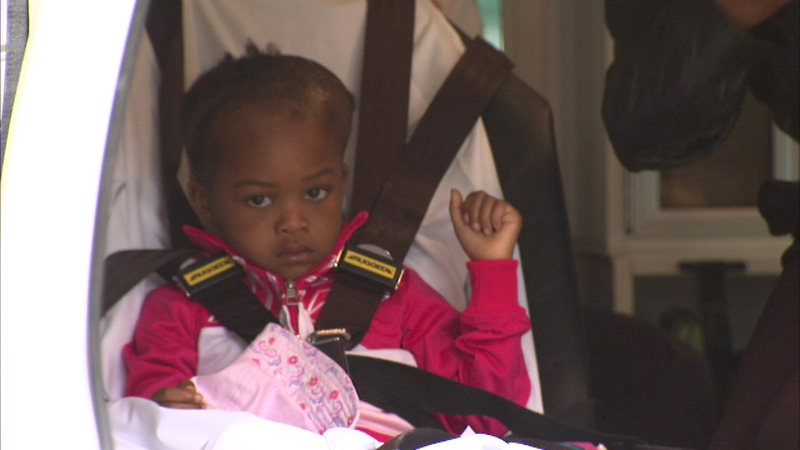 Jacele was transferred by ambulance from University of Chicago Comer Children's Hospital to a Minnesota rehabilitation facility on Monday morning. Her mother spoke as they got into the back of the ambulance. "I also want to thank everyone that did send out their prayers for me and my children. And, I just want to tell everyone to stop the violence. Stop killing our children in our city, please. And, pray for us!" Trenetta Gresham said. Jacele was shot outside a prom party on May 22 near 70th and Justine. Doctors said the bullet didn't go too deeply into her brain, but it's too dangerous to surgically remove part of it. The family was planning to move to Minnesota to escape the violence in Chicago when she was shot.